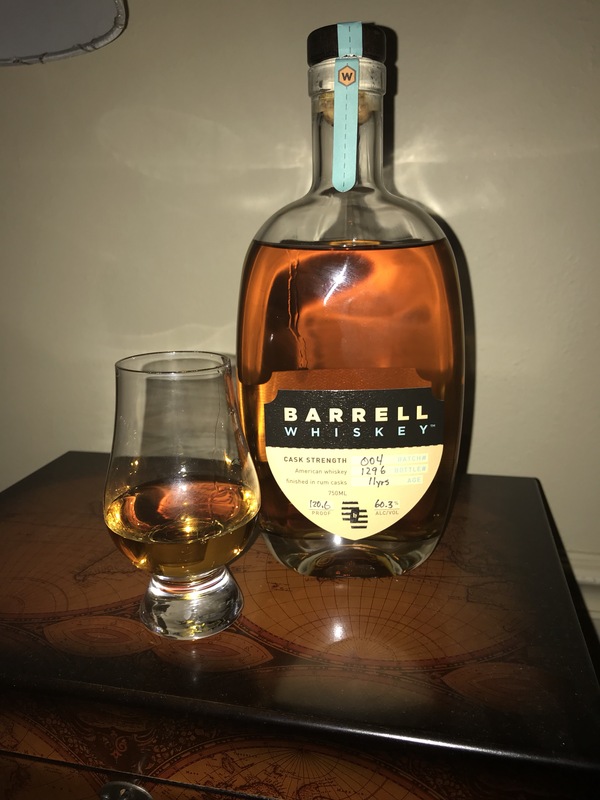 I cracked open another bottle of Barrell tonight, this time the whiskey, Batch 4. This is not a bourbon, but not because of the mashbill, but because it is aged in used barrels. The whiskey is a blend of bourbon mashbills, first put into used bourbon barrels like Early Times and many scotches are. Then, at some point during the 11 years of aging, the whiskey is transferred to used rum casks (think Balvenie rum cask finish) and some of it to casks that aged rye whiskey (Balvenie and Glenmorangie ought to try that!) and then blended together into one whiskey, that is, by the way, $50 a bottle. I point this out to say that a lot of labor went into this whiskey, and most scotches that are finished this way are a lot more expensive. Plus, it is cask strength at a hefty 120.6 Proof and was aged over 11 years. All that being said, I know of no other whiskey you can get for around $50 that has had this much effort put into it and at cask strength to boot. The best way I can describe this whiskey is to say it is like peach cobbler with cinnamon rolled up in a French crepe and doused with powdered sugar. Just amazing. Velvety mouthfeel. I can’t quit nosing it. I totally was not expecting this. Comparisons on this whiskey are difficult. All I can come up with is E.H. Taylor Single Barrel meets Glenmorangie Bacalta, which is a limited edition Glenmorangie scotch aged in used bourbon barrels for ten years and then for two years in retoasted used Madeira wine casks which turn Glenmorangie’s usual orange notes into peach for an absolutely delightful whiskey. Damn, this is just that good. This is one of the best desert whiskies on planet earth. It’s a $200 a bottle whiskey for around $50. The folks at Barrell keep experimenting with their various batches, but I think it would be a really good idea if they kept making this whiskey. They hit it out of the park. They need to send a bottle to Jim Murray who writes the Whisky Bible. This would surely get a Liquid Gold Award.